The New Jutrzenki Office Building was designed as four floors of offices and two levels of underground garages. On the top there is technical floor connected with exit on the roof. The Building has c.a. 2500 m² of office space to rent, located on 4 regularly shaped floors. There are 2 underground levels on garage, accommodating 70 parking places, with another 50 parking lots available on the spacious plot of land, in front of the building. The building plot is situated in Jutrzenki Street near the major traffic routes’ junction, about 5 km from city center with excellent access to urban communication. 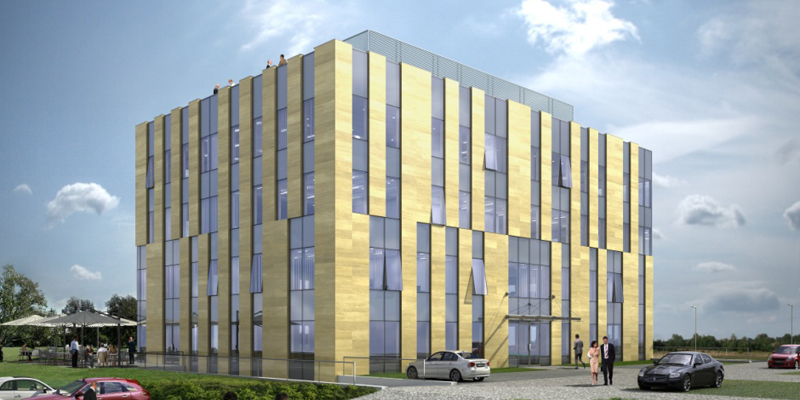 The New Jutrzenki Office Building is one of the very few fully environmentally friendly business developments in Warsaw, which was further confirmed by BREEAM certificate.The building has achieved a BREEAM score of 59,05%, which translates in to an interim design stage BREEAM rating of Very Good. Similar building in close neighborhood has took place in TIBUCON (Towards Integral BUilding CONnectivity) project for 36 months beginning from September 2010 to August 2013 as DEMO building. Tibucon team has been trying to establish a valuable method of determining the alleged improvement of comfort levels in the building.